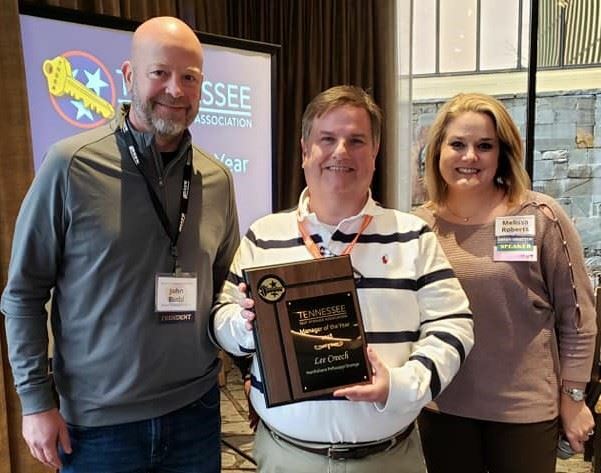 The Tennessee Self Storage Association (TNSSA) has named its 2018 Manager of the Year. The recipient is Lee Creech, manager at Northshore Pellissippi Storage located in Knoxville, TN. Creech has been with his facility since 2012, during this time he has brought the occupancy rate from 67% up to 93.6%, while the facility's revenue per square foot has also increased by 53% during this time. By combining his revenue management skills with his customer service philosophy, he has kept our facility's delinquency rate to 1% or less each year. In the past year, he has also overseen the coordination of an expanded online marketing campaign for his facility, resulting in the launch of a redesigned, customer-friendly website that has not only improved their online sales, but has improved the face they present to the public for current and future tenants. Creech knows that growing a business’ profitability is about improving the customer experience. “How can we make this better for the tenant?” is one of His mantras. It's why he has implemented regular physical improvements to the facility from cosmetic touches like re-landscaping the property with plants native to the region, new paint and improved directional signage, to matters of improved convenience such as the installation of a coffee machine or converting our restrooms to hands-free technology. He also works ceaselessly to represent his facility in the community from participation in local Chamber of Commerce events to sponsorship of area school programs and athletics. He partners with the tenants to find new opportunities to make Northshore Pellissippi Storage a more active member of the community. It's that kind of approach to building community within our facility between tenants, staff, and vendors, and building community relations outside the facility that makes it not surprising at all to find that tenants and vendors alike greet Creech and the staff by name when they visit and that he and the staff are able to respond in kind. Creech’s extra mile approach is why our tenants regularly recommend them to their friends and neighbors. It is why customers have been known to bring friends to the facility to “show off’ the building where they store their belongings exclaiming, “This isn’t like any other storage you’ve seen”. "Veronica Lavoe Williams has taken our location from (6/17) 90% & 9% delinquent rate to 93% & 5% (10/4) delinquent rate, also, increasing revenue for a developed property by 60k in a year, 3 months. The area this facility is located the crime rate is very high. She has worked extremely hard keeping the location clean, rent ready, & still continues to increase revenue, and occupancy."